Thanks Gussy, now come back and join us! Well done guys! Good first week it looks like! Glad to see Eternal back to raiding! 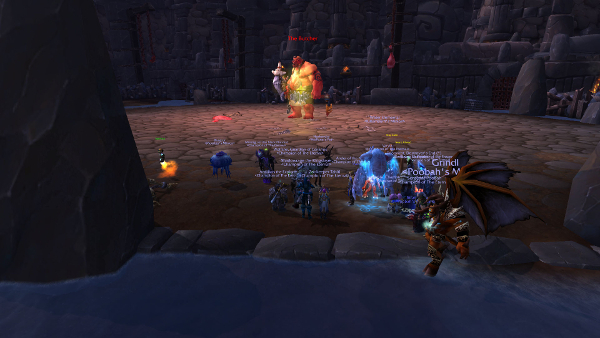 5 days ago we began raiding the new Highmaul content. We started on a Friday with about 5 guildies and pugged the rest (up to 10 people). We took several tries at Kargath and after managing to avoid the tiger pits and fire traps we downed him. Here we are all lined up. After defeating Kargath, debating the pros and cons of clearing trash or doing the next boss, we ended up attempting the Butcher. This guy butchered our hopes and dreams. We didnt' end up beating him that Friday, but started fresh on a Tuesday with a (nearly) full guild run this time, and we managed to fairly quickly down Kargath again, and deployed a new strategy for fighting the butcher. After less than 10 tries we got him down. 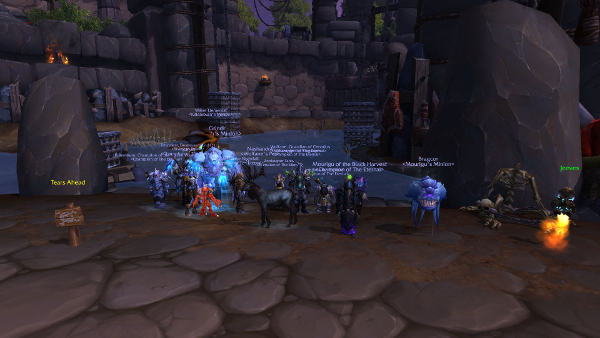 We called it a night and picked it back up on Wednesday..
At this point we had a choice, either Tectus or Brackenspore. I voted for Tectus because that's the strategy guide I happened to have read, but luckily the group ended up choosing Brackenspore. After many attempts on Brackenspore our strategy became more refined and we got closer and closer until we finally managed to kill him. It was a little surprising we still had people alive. As it was quite late and we had been at it for sometime we decided to call it a night, but first we rushed to his body for epic loots.